November 8th took on new meaning for the CAHAL staff. Rabbi Boruch Ber Bender, founder and president of Achiezer, was invited to address and advise the staff of CAHAL on how to help their students understand and become more involved in acts of chesed. 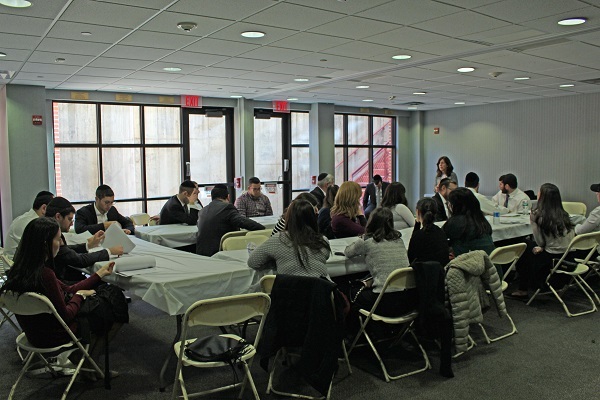 The Young Israel of Lawrence-Cedarhurst graciously hosted the gathering. Rabbi Bender vividly described how chesed is not just a project, but a way of life. He shared many stories about community members who became involved in chesed activities through Achiezer, and how they enabled their children to experience giving chesed first-hand. He suggested that we ask our students to picture themselves on the receiving end, so that they can begin to develop empathy and the ability to feel someone else's pain. Rabbi Bender suggested that we can identify simple ways to live chesed. Chesed opportunities are often right in our own backyards, and they are a win-win for both the receiver and the giver. Some of his practical examples included helping elderly neighbors after a snow storm by shoveling their walk, helping bring food to restock hospital respite rooms, and making challah covers for families who stay in hospitals over Shabbat. The CAHAL staff was tremendously inspired by Rabbi Bender's presentation, some sharing their own experiences with the aftermath of Hurricane Sandy, and how grateful they were for Achiezer's help. Rabbi Bender concluded by reminding everyone that chesed empowers children and builds greater confidence and self-esteem. After the presentation, the CAHAL teachers collaborated to plan chesed initiatives with their classes and in the community. The staff also expressed interest in helping to expand Achiezer's newest initiative, CIMBY (Chesed In My BackYard), to include even more opportunities for children to engage in doing chesed.